HomeTumors of the Nervous System in ChildrenSupratentorial Tumors in ChildrenSupratentorial High-Grade Gliomas in Children HomepageManagement of Supratentorial High-Grade Gliomas in ChildrenTips And Techniques for Treating Supratentorial High-Grade Gliomas in ChildrenTechnique for Resecting a Supratentorial Anaplastic Astrocytoma in a Child – by John Myseros, M.D. 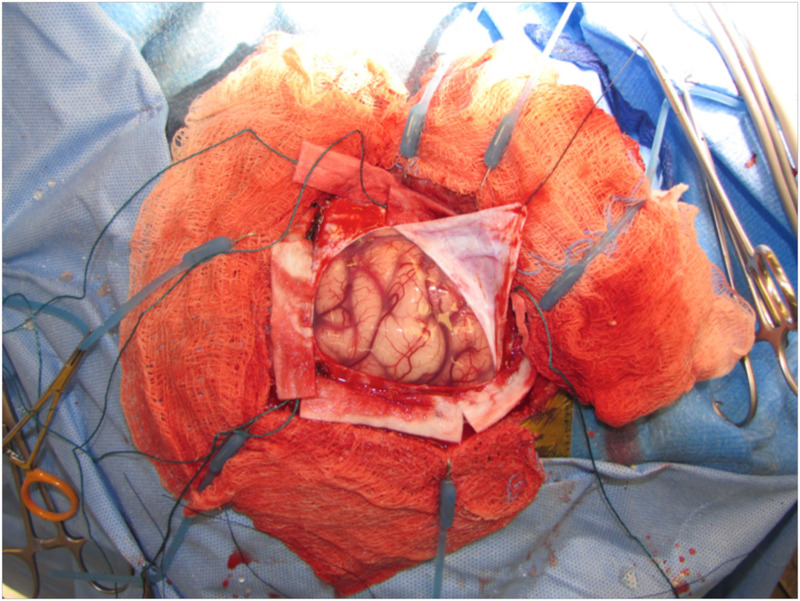 The following is a photo progression of craniotomy for a dominant (left) frontal lobe AA in Broca’s area in a 6-year-old boy with seizures. 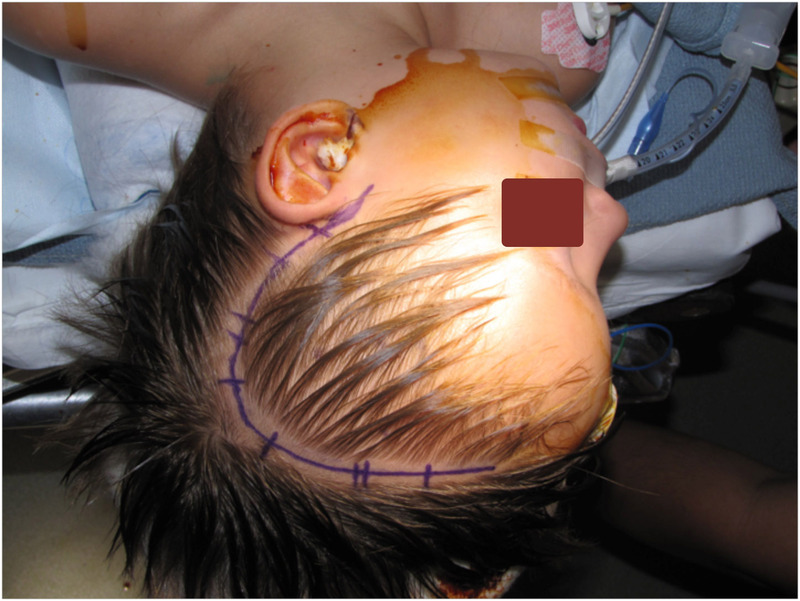 Positioning for resection of left-sided AA: The boy is in a supine position, roll under his left shoulder, head turned to the right, scalp prepared and marked for incision. 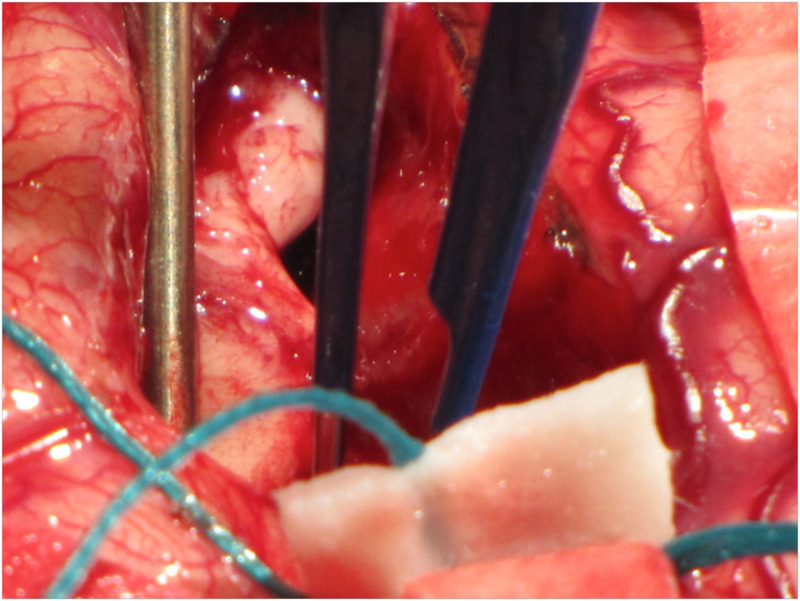 Scalp and temporalis muscle turned as single flap: A left fronto-temporal myocutaneous flap has been turned anteriorly. 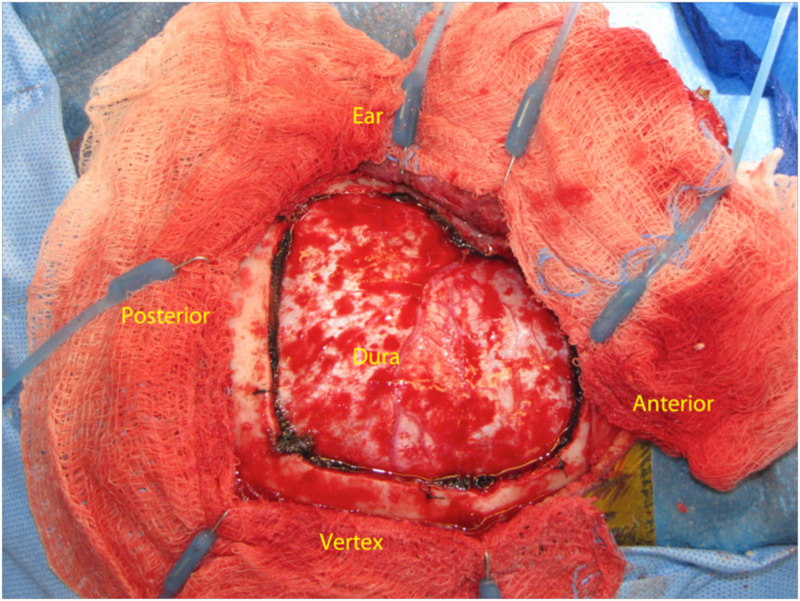 Frontotemporal craniotomy: A frontotemporal bone flap has been removed and the dura tacked to bone. 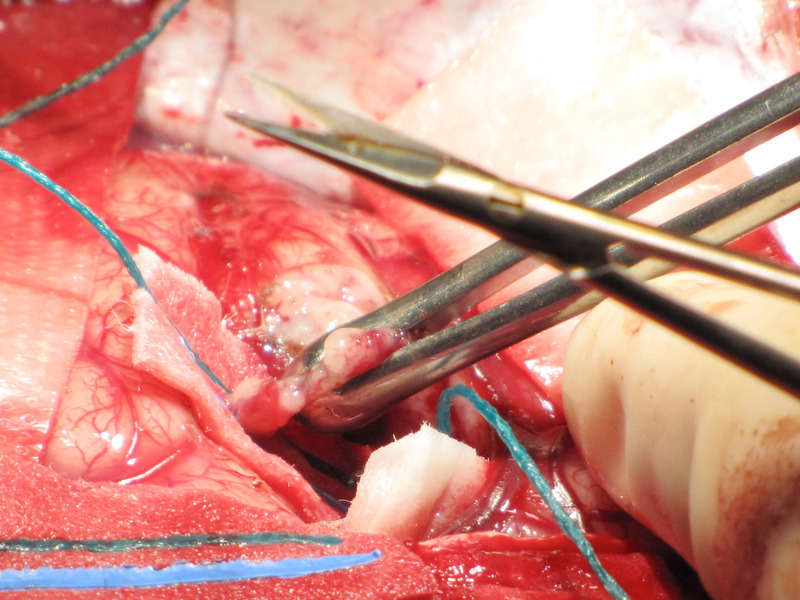 Exposed cortex: Opening of the dura exposes the brain. Swollen gyrus marks location of tumor. 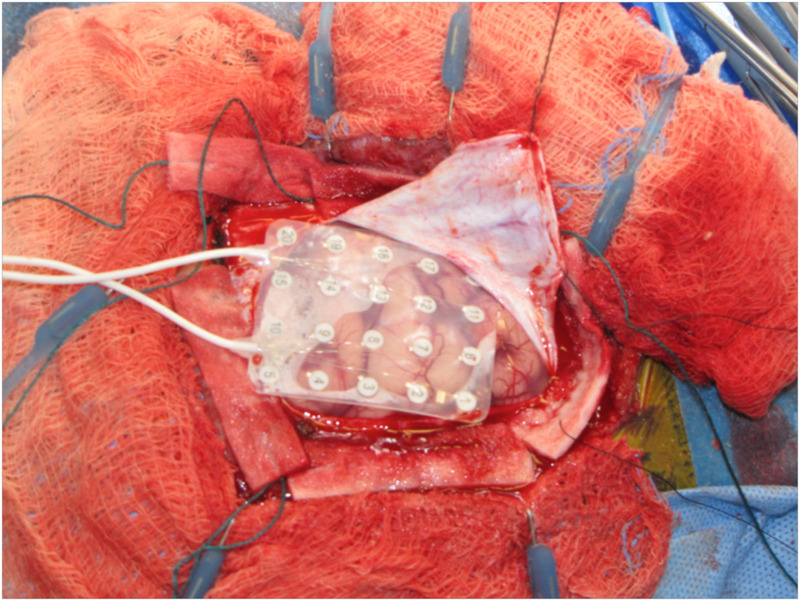 Placement of 20 contact electrode grid: Intraoperative electrocorticography is done to evaluate for epileptogenic foci and to identify motor cortex using stimulation through grid and/or by phase reversal of sensory evoked potentials (cortical mapping). 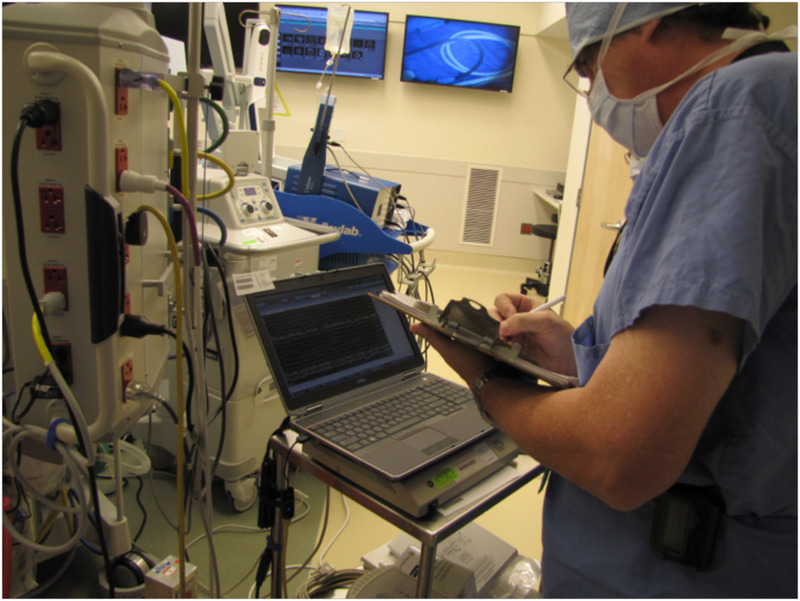 Monitoring personnel: Neurologist evaluating intraoperative electrocorticography (ECoG). 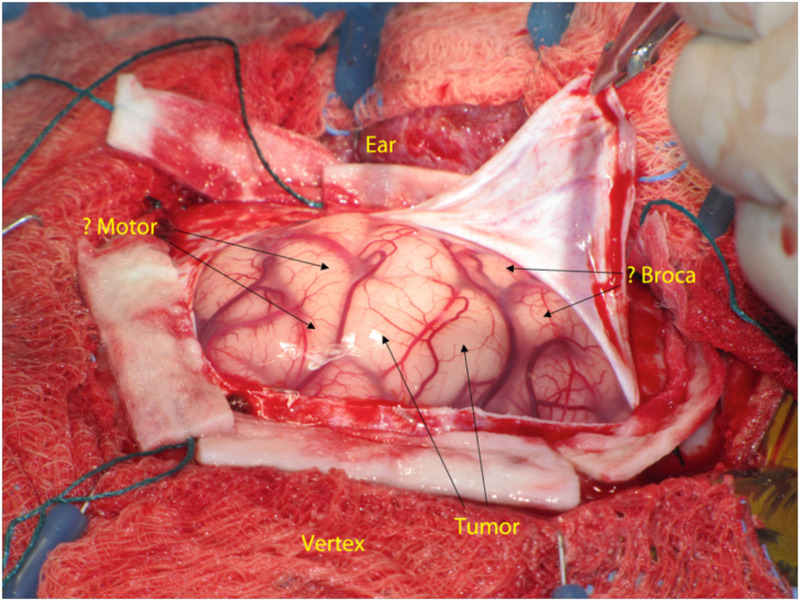 Cortical incision: Shown is a dissector being used to perform a cortical opening to expose the tumor. 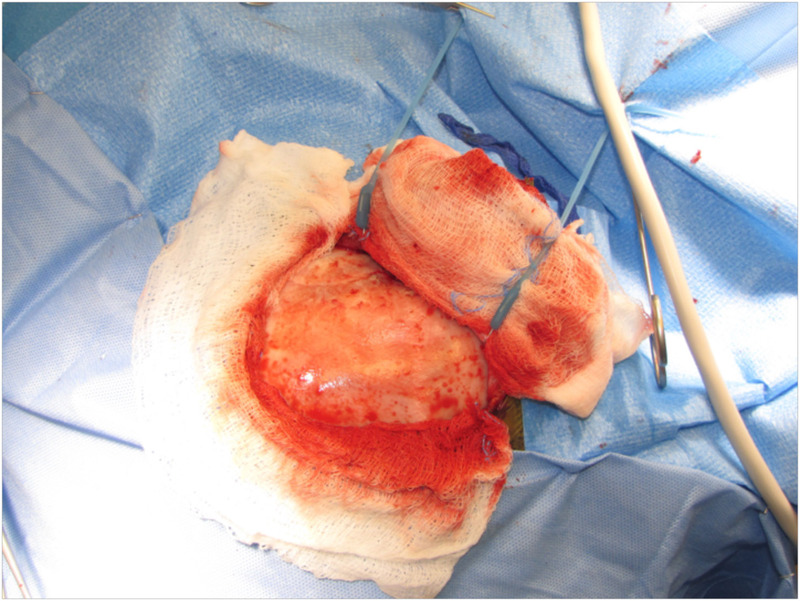 Resecting the tumor: Sharp dissection in addition to ultrasonic aspiration, blunt dissection with micro-dissectors, and suction/bipolar cautery are used to accomplish the tumor’s removal. 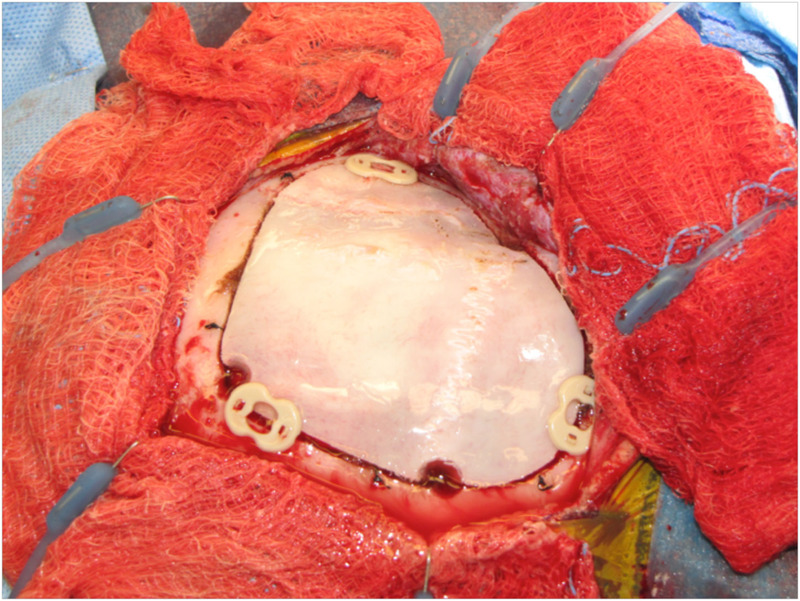 Resection cavity: After the tumor’s removal the swollen appearance resolves, with the gyral patterns and vascularity assuming a more normal appearance. 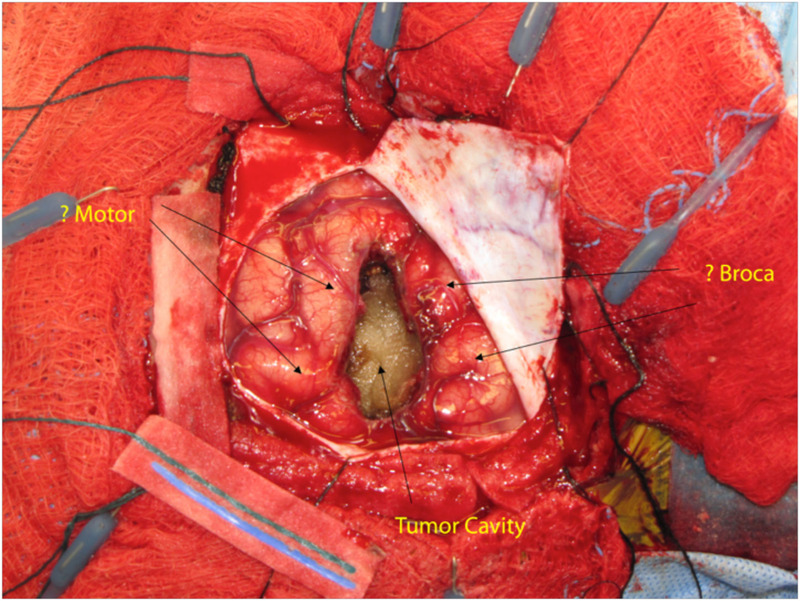 Higher magnification of the tumor cavity: Under microscopic magnification the walls of the resection cavity begin to appear as normal white and gray matter at the margins of the tumor. 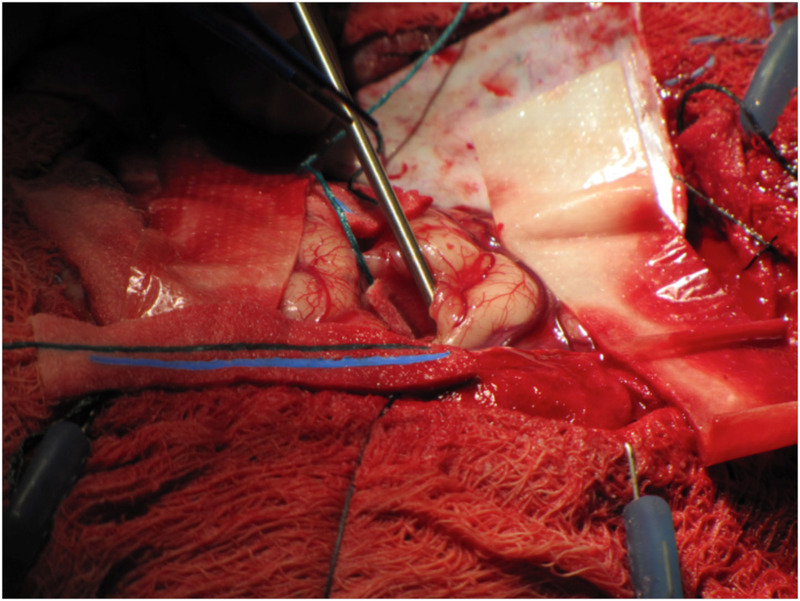 Dural closure: The dura is closed to avoid CSF leakage and adherence of the cortical surface to any material in the epidural space. 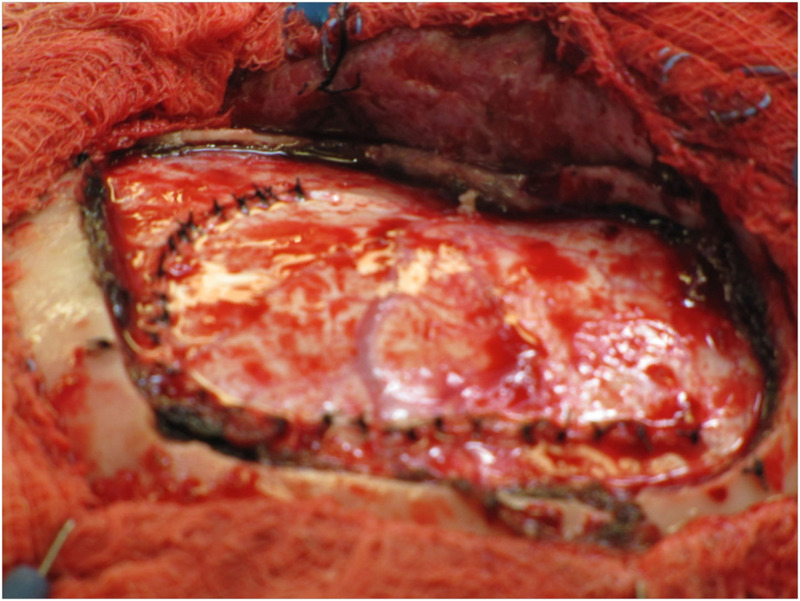 Bone flap reattached: The bone flap is fixed into position so that it can revascularize and undergo the normal reossification process. 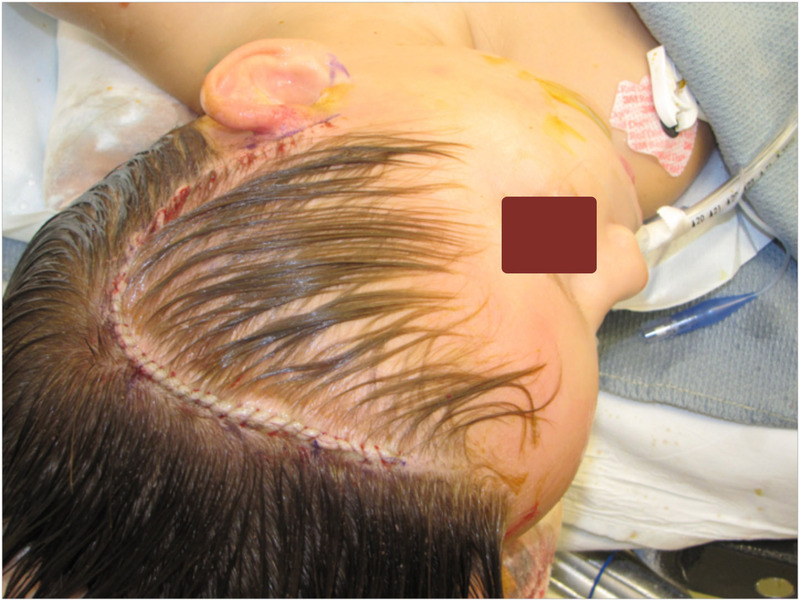 Scalp incision closed: The scalp is closed in such a manner that removal of any suture material will be as easy as possible for the young child.